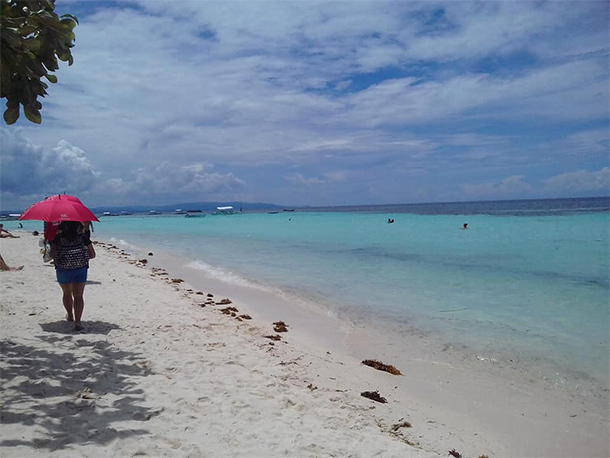 With the closure of Boracay for 6 months, travelers who are looking for the another fine white sandy beach in the Philippines will definitely love Bolod Beach in Panglao, Bohol. For those who do not know, Panglao Island is located at the southwest of the island of Bohol. It’s a local popular destination for those who are looking for white sandy beaches in a provincial setting. The island also boasts of world-class diving sites that makes it one the Philippines’ beautiful tourist destination. 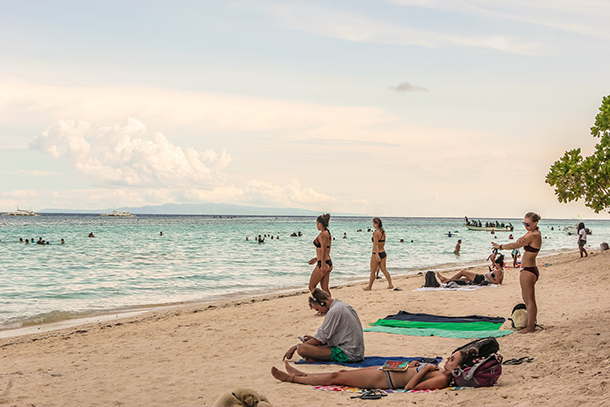 Among its popular beaches are Alona, Bagobo, Bolod, Danao, Doljo and Momo Beach. On this particular trip, we explored Bolod Beach. Bolod is easiest reached via Tagbilaran City in Bohol. 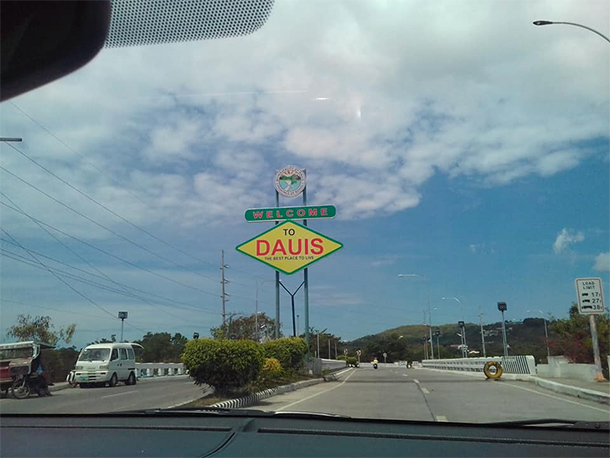 Tagbilaran has an airport and a sea port that serves as the gateway to the various attractions in Bohol that tourists and travelers will love to explore. From what we heard, the Panglao International Airport is currently being developed. If you are coming from Manila, taking the local airlines for your flights are easy enough.Travel time is around an hour. Skyscanner has several flight recommendations that you can choose from. It’s the best way to compare flight prices in the country. If you are from Cebu, you can easily ride a fast craft to take you the island. Frankly, the prices are cheap and very affordable. Travel time is around 2hours, and for us traveling with a kid, the travel time is pretty great and not too long. Once you reach Tagbilaran, you can easily hire the local tricycle to take you to Bolod. But be prepared to haggle as prices may vary. Usual price starts at 150-200 Php. If you want to be more economical, taking the public transport can be an option and are available at the Dao Integrated Terminal. To get there, simply hire a tricycle to take you. Or maybe rent a car as your mode of transportation. Doing road trips in Panglao Island is very nice as the countryside is safe and the roads are passable. Also, the Boholanos are one of the most friendliest people I know! 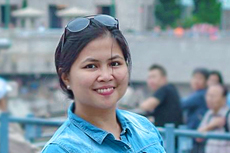 I’ve been to Panglao several times in the past years – both for a vacation and side-trips during some of our business travels before but we usually would only visit one of Panglao’s popular destination: Alona Beach. 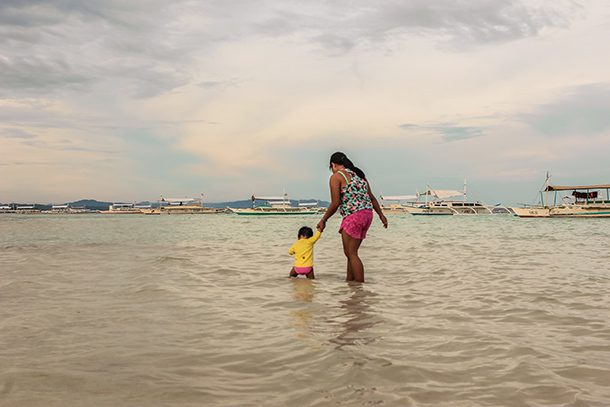 As we were traveling with my daughter this time, we were basically looking for a nice relaxing location within Panglao to spend a few days in. Thankfully, a friend of ours recommended this nice resort in Bolod, Panglao commending how nice the beach is within the area. When we arrived, I was truly mesmerised by Bolod’s clear water – one of the greenest sea water I’ve ever seen. It was so good to the eyes that me and my husband didn’t mind the 5-minute walk towards the resort. The entire beach/ shoreline are dotted with several resorts of all class: budget and luxury. I’ve included a list of resorts you may want to look into near the end of the post. 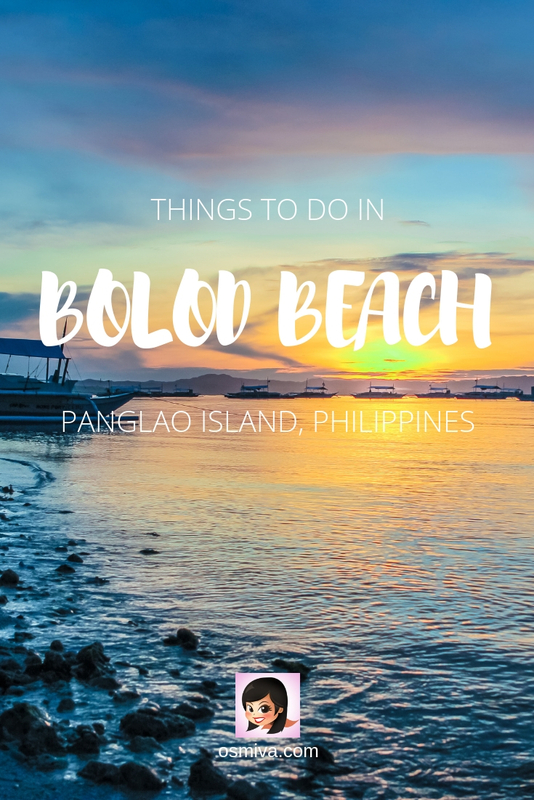 There are a lot of things to do in and around Bolod, Beach. It’s an amazing place to visit when you are with family, friends and even your partner. After checking in and leaving our things inside our room, we were very eager to explore the area and make the most of our short vacation. For those who’d love to explore too, we have collated some of the best things you can do! The beach at Bolod Panglao is really amazing! I could spend hours just enjoying the water. Unfortunately I didn’t have that luxury as we had our daughter with us. But my brother-in-law certainly did! 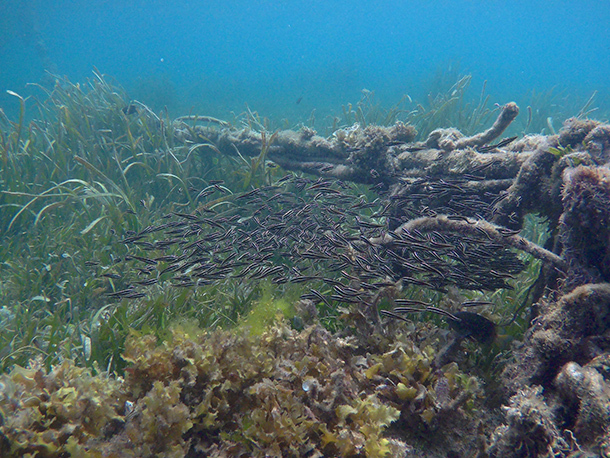 He even got around snorkelling to deeper areas and seen some nice sea creatures like star fish and school of fishes. You don’t have to go island hopping to find lovely sandbars (like those at the South Sandbar and Mocaboc Island). There’s a sandbar just a few meters from the resort we were staying in. We took our daughter here for a dip in the water. She just loved it! 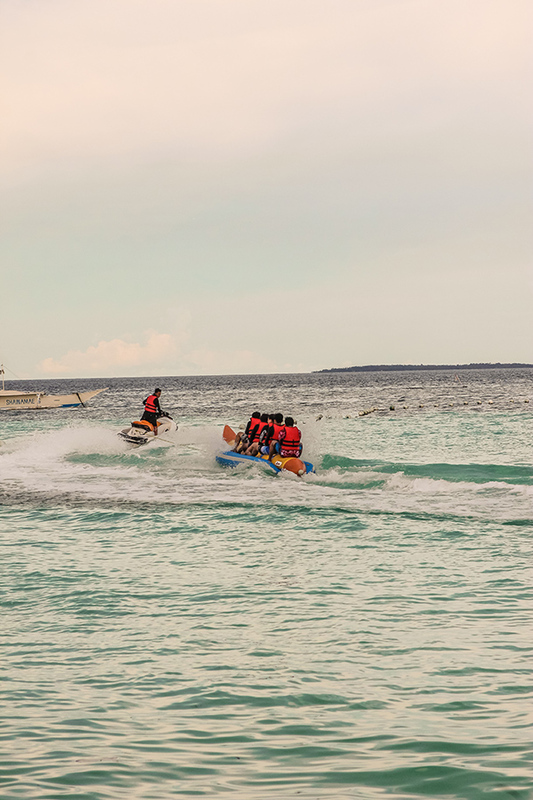 There are watersports available in the area too, particularly at the Dumaluan Beach Resort. You can hire a banana boat, jet ski, go parasailing or wake boarding here. We didn’t try it though but we enjoyed watching other groups try it. Bolod Beach has a long stretch of shoreline that if you’d like a tan or perhaps read a book while lounging on the sun, you can certainly do so! Be mindful of the high and low tides though. There are several resorts offering delicious food in the area. It’s a bit expensive than we are used too but the servings are generous enough that you can share. This’ll be very cheap if you are with a group and can divide the price between yourselves. We have tried several restaurants in the area and it was so cool that choices are not limited. Fresh seafood were always available as well as vegan dishes. If you are like me who love a quiet time and enjoy just strolling alone, you will certainly love it here! Bolod Beach is not really was crowded as beaches in Alona, so you can definitely enjoy a quiet moment wandering along. Sick of the beach? 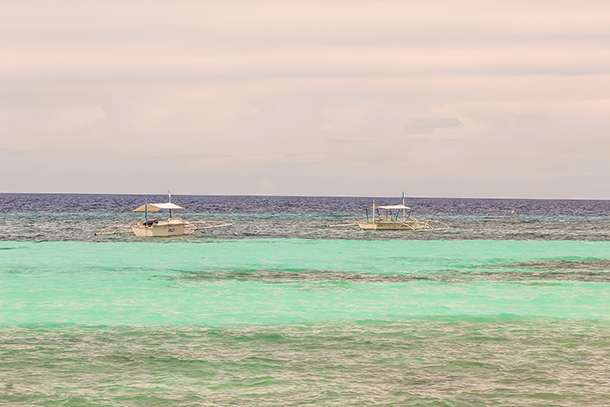 You can easily hire a guide to take you to a Panglao Day Tour. There are several tour guides who will love to take you with them! The tour can be taken for a half day so you’ll still have plenty of time to enjoy the beach afterwards. If you want to go further at sea, going on an island hopping will be cool for you! You can easily arrange one with the resort as most of them have contacts to boatman in the area. The tour can also be done for 4 hours so you can easily do this tour before the Panglao Day Tour. Don’t forget to bring your island hopping essentials! 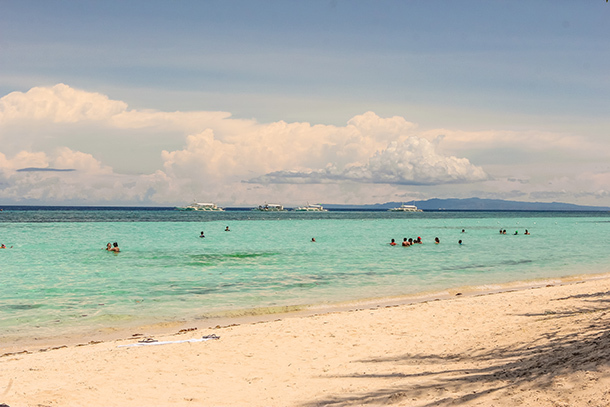 Bolod Beach is near several popular attractions in Bohol including Alona Beach and Bohol Island. If you want a change of scenery, hop on a tricycle and go to Alona Beach just a few minutes away. 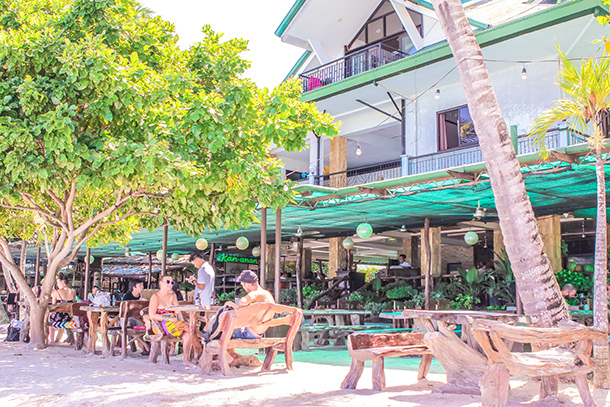 Alona Beach is popular for its Dive Centres and the thriving beach vibe. There are plenty of commercial buildings nearby and lots of dining options especially at night. 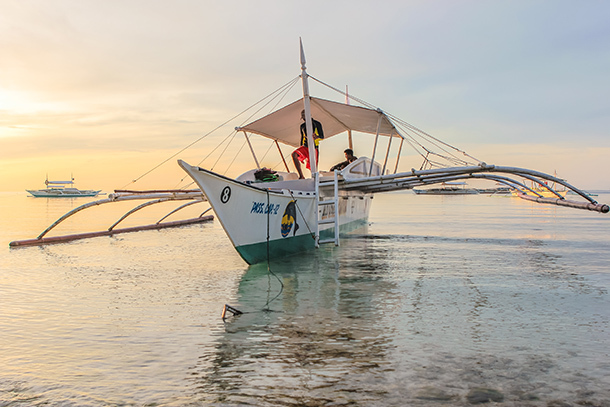 You may also opt to head out to the mainland and explore Bohol and do a country tour. The country tour basically takes you around Bohol’s popular tourist attractions including the famous Chocolate Hills, Sandugo Site, the Manmade Forest and the Loboc River Cruise to name a few. Dumaluan Beach Resort is centrally located at the Bolod Beach with lots of cool water sport activities readily available for its guests. The resort also has good dining options for hungry guests including a bar, coffee shop and a restaurant. Not to mention the comfortable accommodation that this 3-star resort offers. Panglao Grande Resort or Whites and Greens Beach Resort is a 2.5 star hotel that boasts of fantastic facilities including 24-hour room service, free Wi-Fi in all rooms, daily housekeeping, Wi-Fi in public areas and a spacious garden for guests just wanting to relax the whole day. You may check out our full review of our stay at the resort. Find the perfect room for you here! Bolod Beach Resort is a 2-star hotel that boasts of unparalleled service and thoughtful amenities available for all of its guests. Services and conveniences offered are a convenience store, luggage storage and a smoking area. For dining options, the resort has BBQ facilities, room service and shared kitchen. Check out the resort’s hottest deals here! Look for available rooms at this resort here! Luxury and comfort is what this 5-star hotel offers to its guests. South Palms Resort not only has 90 inviting rooms available but a wide variety of recreational activities including a badminton court, private beach, fitness center, outdoor pool and massage. Plan your stay by booking a room here! Bolod Beach certainly charmed us when we visited. Personally, I love the relaxing ambiance it had and we would love to come back again! Have you been to this part of Panglao? Share your story with us in the comments below! Disclosure: We use affiliate links on some of our resources below. Meaning we get a commission when you avail a certain service by clicking on the link at no extra cost to you. This island and the water look so beautiful! Thanks for the info! I’m definitely going to keep this place in mind when I go to the Philippines next year. I love the Philippines! The beaches there are some of the best in SE Asia 🙂 I had a short stop in Bohol but didn’t get to visit a beach…definitely next time! thank you for this comprehensive post! Incredible pictures and some very good advice on getting to Bolod. 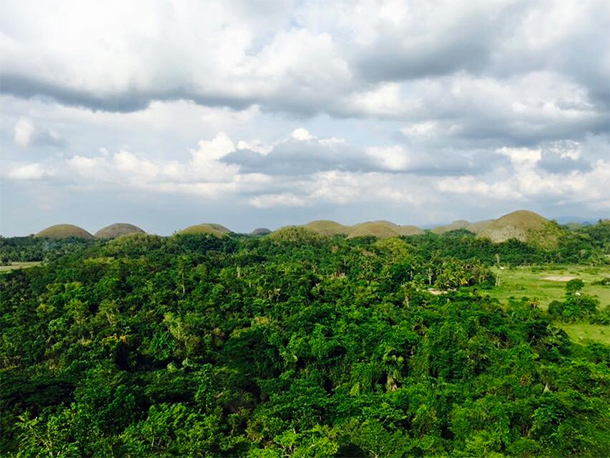 I’m dreaming about Chocolate hills. I would love to visit Philippines next year. Beaches look so perfect. First of all, this is stunning! I’m glad there’s an alternative. I get why they needed to close it for a bit, but it’s nice to know about other beautiful spots. Thanks for the guide! This will definitely make any trip to the area easier. Awww.. Glad to be of help, Taru.. 🙂 Hope you get to visit Bolod Beach too! Wow! I would love to just take a walk or read/tan as you say on the beach! The resort seems fun but i would take a trips on the authentic boat trip! Great read! 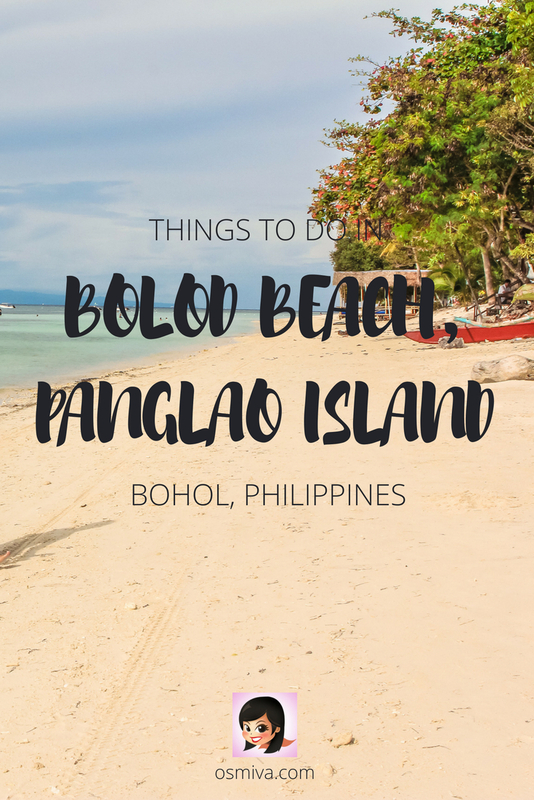 Bolod looks like an excellent alternative to Boracay. The beach looks gorgeous and love the fact that there is a sandbar nearby too. Snorkelling and exploring the undersea world here would be fascinating. The water sports options to look exciting. All in all another gem of the Philippines unveiled. A complete family destination. I had NO idea that Boracay was closed off to tourists during some part of the year. I completely understand why and I think that Bolod beach is a beautiful alternative. The beaches look stunning so I would love to stay at one of the resorts there! There is so much to do at and around Bolod Beach. I felt the beach is quite clean too. Your that boat picture is amazing. Would love trying some water sports as well island hopping. Like always another find in Philippines. Beaches with sand bars are my favorite kind of beaches! 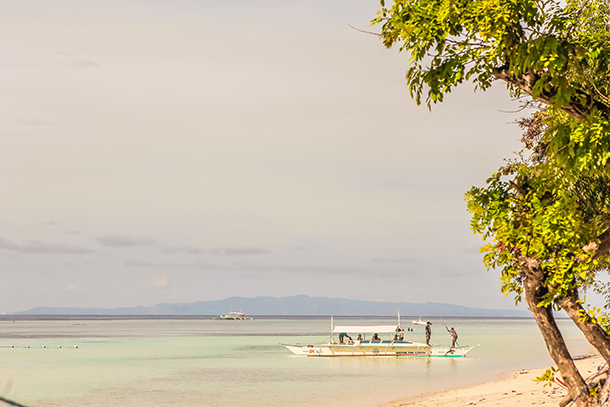 Bolod Beach in Bohol looks perfect – white sand, blue waters, great marine life. I would love to experience snorkeling and scuba diving here. Even water sports are great. So many new places in The Philippines keep popping up and it doesn’t surprise me because that country is a treasure trove of beautiful landscapes and hidden gems! Panglao and the rest of Bohol is beautiful. Bohol has a lot to offer. I also love Boracay but I really hope that tourism will not be a way to destroy the natural resources and the beauty of the island! Philippines is really beautiful but I feel that they give up easily on tourism and sacrifice environmental issues if the government feels they will earn from it. Really sad. What an extensive guide! Lovely colours, real azure. And loved those underwater scenes while snorkelling. The island hopping is something I’d like to do. I am so glad that Borcay is closed for a bit. It is nice to let the area recover. Bolod Beach looks amazing. I hope the crowds don’t ruin it as well. I would love to stay in Panglao Grande Resort. May I know where you stayed? I’m currently scouting for a good beachfront resort (on a budget) within dumuluan beach / bolod beach for next year, April. Thanks. We stayed at the Panglao Grande Resort 🙂 You can check out our review here : https://osmiva.com/resort-review-panglao-grande-resort-philippines/ . Hope this helps!